Journey to Prince Rupert | Turning my world upside down! The Inside Passage sail to Prince Rupert is considered one of the loveliest ways to get to the north Pacific. There were many tourists from different nations on our ferry, some of them bound for Alaska on a connecting cruise. I had booked us a reserved seat in the Aurora lounge where the view is supposed to be the best and snacks are served regularly. The view was great but the snacks didn’t really impress – a couple of cookies and some water. Oh well, at least the company was fine, as was the weather. We took a walk around the ship’s deck and found the rear deck was sunny and warm, the perfect place for our lunch picnic. They do have bbqed weiners and beer available at lunch but we had brought our own food as I had decided we’d have a nice buffet dinner in the dining room instead. The cruise lasted about 15 hours, so we had plenty of time to sit outside and chat with other tourists, nap, eat too much at dinner (the buffet was indeed delicious) and even watch a movie. As promised, the scenery was gorgeous. I didn’t take many pictures as it’s hard to do it justice. Gee, you guys are halfway to Alaska at Prince Rupert, are you going for broke and going all the way to Alaska. Maybe you could call-in sick and stay out of school until the end of September…Just kidding! I never realized that you would be going so far North! Again, great pictures and definitely interesting blog! We are on our way to Alaska, actually. Just a quick stop over the border at Stewart, BC. Should be there in about 3.5 hours. Glad you are continuing to enjoy. The scenery up the Skeena River this morning was fabulous! Another treasure. I loved the inside passage cruise. 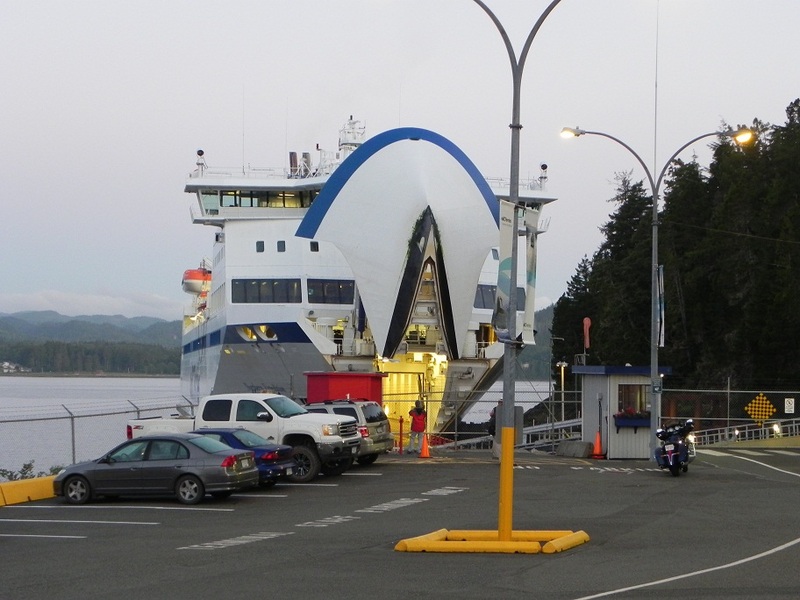 Are you taking the Alaska State Ferry to any of the Alaskan ports? Great photos. Thanks for reminding of the great scenery! No ferries to Alaska but we are driving there today. Just a quick stop over the border mind you. Great. Enjoy a peak of Alaska. Ketchikan is a nice town–cruise port, so lots of tourist options. Have fun wherever you go in Alaska. So many totem poles in that area also. Lots of totems in Haida Gwaii too. I will post about that part of the trip soon.